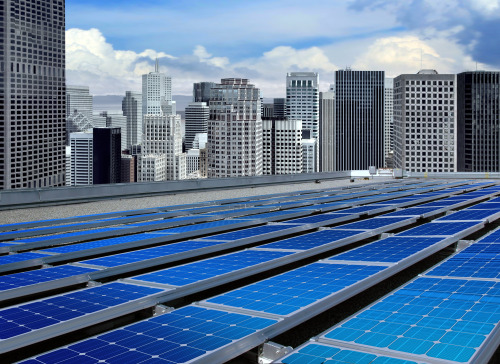 Companies are looking to renewable energy as a source of power, building off-site generation or rooftop solar stations in order to fulfil their ambitions (image courtesy of Shutterstock). The global demand for renewable electricity continues to grow at a rapid pace. Much of the demand is driven by an increased sense of urgency among leading international businesses in contributing to combating climate change – by switching from fossil based power to clean, renewable energy. The backdrop transforming these businesses from being passive bystanders to proactive contributors is closely related to an awakening spurred by the process of establishing the ambitious UN framework of Sustainable Development Goals (SDGs) in September 2016, and the inclusive process of finding common ground for fighting climate change among 195 countries at COP21 in Paris later the same year. This global backdrop has spurred leading companies across most industries to take charge of their destiny, defining a clear sustainability agenda as critical to their future competitiveness. Waiting for «the others» to lead, is not an option, while “teaming up” to bring a collective weight to the market has become the way to move forward. The last two years have seen numerous initiatives arise – many with similar goals of securing access to renewables to power all operations – in all corners of the world. The most far-reaching initiatives are WeMeanBusiness and the RE100. The RE100 initiative was established by The Climate Group and CDP, and now has 83 corporate members, all having pledged publicly to consume 100% renewable energy; a large majority committed to a 2020 deadline. In the “energy transition” we all sense is upon us, the power of the consumer has so far been very much undervalued. But now consumers’ demand for renewables is finally being noticed, and even more so the collective purchasing power of the corporate world. RE100 is the first ripple of a wave, on its way to becoming a tsunami of devastating force. This corporate wave is broadening out by weekly new members joining in. The wave is building depth and additional power through the RE100 companies pushing their renewable energy ambitions down their supply chains, thus gaining even more speed and momentum. To feed the tsunami, companies are asking for choices; real alternatives to fossil based energy, but also alternative paths for ensuring access to renewables. Although these companies share a common renewable ambition they vary widely in how they plan to reach their targets. It means that “one size does not fit all”. Some are in a position to take a long-term industrial approach and provide capital and resources to build new off-site generation. Others are looking to utilize onsite roof space for incremental solar generation, while again others are looking primarily for long term price certainty and opt for using PPAs from renewable power plants. But even with the onslaught of many new renewable options, a large majority of companies will still opt for sourcing their renewable power from the local power grids. All of it, or parts of it. The underlying need, shared by these corporates, is that their chosen alternatives are backed by credible endorsements from independent stakeholders and reporting standards like CDP and GHG Protocol. A key ingredient enabling such endorsement is the use of standardized tracking and documentation instruments for renewable power, providing transparent proof of renewable procurement. In Europe such tracking is available and is known as Guarantees of Origin (GOs), while a similar system – RECs – is in place in North America. Based on “best practice” from 15 years of operations in Europe and N-America, the International REC Standard (I-REC) has been developed. I-REC is currently being deployed in numerous countries in Asia, Latin-America and Africa. Along with GOs and RECs, I-RECs are accepted by key stakeholder organisations, as THE way to document renewable claims. This is a great development for forward-thinking businesses, and allows a simple, trustworthy and standardised way to document any and all of their renewable purchasing claims. Across operations. On all continents. When pledging to go 100% renewable these leading corporates are dead serious about the path they have taken. They will challenge, push and kick local energy providers and governments until they can deliver on their renewable pledge. Never underestimate a tsunami. This one is fast building momentum and speed, and soon has the power to reshape the global energy landscape. Tom Lindberg is Managing Director at ECOHZ.